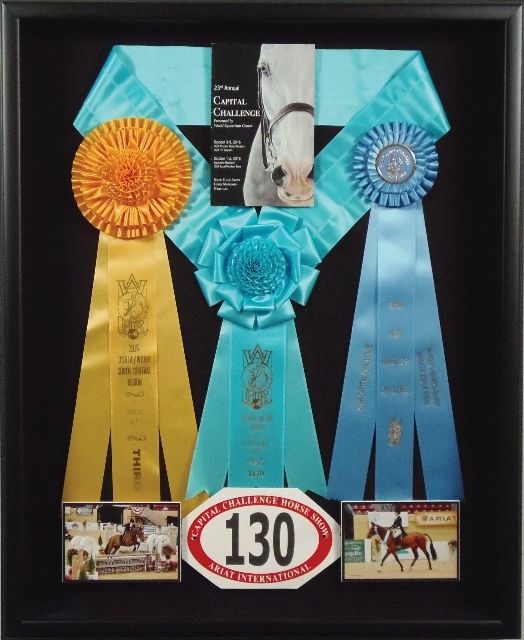 Sharon Beshouri wanted to create a shadowbox highlighting her daughter, Eleanor’s equestrian achievements. Eleanor and her horse, Caterpillar, won multiple ribbons from the Capital Challenge Horse Show outside of Washington D.C. The layered design includes action photos, contestant badge, placing ribbons and the brochure from the event. This is a great way to honor your child’s achievements in extracurricular activities; especially for the upcoming high school seniors graduating this May! Thank you Sharon for letting us create this design. This entry was posted in Custom Framing Designs and tagged Competition Ribbons, Custom Framing, Graduation Gift Idea, Horse Show, Horses. Bookmark the permalink.